Kiss of Death decided to shake things up this week for #1lineWed on Twitter. Instead of a theme, they’re asking for cliffhangers, ie. the hook line at the end of a chapter. I’m not sure this snippet qualifies, but maybe. I also don’t remember if I posted this particular snippet here. It started out as a bit of #flashfiction and has been edited and expanded. I’ll leave it up to y’all as to whether or not the last line qualifies. He squashed the anger welling up inside him. He’d known exactly who and what Sade was from the moment he’d first laid eyes on her. She’d stalked into his life, with those snapping green eyes, stubborn jut of her chin, wearing her badge like a suit of armor. Still, she had, and continued, to fascinate him. She should have been like all the other human women who’d enticed him through the long centuries of his life. What was the modern phrase? One and done? Yes. He’d meant to seduce her, enjoy her, and be done with her. He almost laughed at his foolishness. Sade was a siren who’s song he couldn’t resist. He’d gotten involved in her case, and continued to remain at her beck and call. Still, he was egotistical enough to want her to focus on him. He blinked. No. Not him, but them. As a couple. Maybe he was the fool Mathias called him. A relationship between a vampire and a human? Especially when that human was the lead FBI agent on the Bureau’s MAGIC unit? She had assignments. He understood her job was important—not only to her, but to the entire magick community. But she’d been gone three weeks. With that damnable dragon in attendance. Jealous? Damn straight he was. And she was asking for another week. Away from him. “Sinjen?” His name sounded uncertain when she said it. He’d been quiet for too long as he considered the complexity of their relationship. Her anxiety was almost palpable even across the distance that separated them. “Come home, Sade.” It wasn’t an order, it was a plea. Silence stretched. Seconds ticked off like, each one swooping in to perch along the edge of perception until time became a murder of crows anticipating battle so they could feast upon the fallen. When she finally spoke, it wasn’t what he needed to hear. He pinched the bridge of his nose and swallowed the swell of dark disappointment attempting to engulf him. “What’s that supposed to mean?” Her voice whiplashed through the phone’s speaker. “Exactly what I said. Do your job, Sade.” As you always do, he thought. Then, before she could reply, he added, “Good night.” He stabbed his cell, ending the call, then turned off his phone. “Coward,” he acknowledged out loud, but better that than freeing his hurt and saying something that could not be taken back. Light from the full moon filtered through the blinds as he stared out the window of Sade’s DC apartment. Sinjen considered going to her, knowing it would be a mistake, perhaps one fatal to their relationship. Or was it already too late? So…as a reader, would you turn the page to find out what happens next? And if you’re a writer, show us what you got! We want your cliffhanger hooks so drop them into the comments. 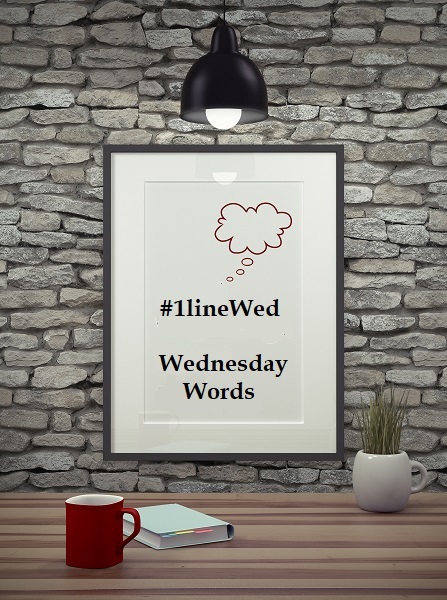 This entry was posted in Writing Life and tagged #1lineWed, inspiration, Penumbra, quotes, reading, snippet, Wednesday Words, WIPs, writing. Bookmark the permalink. Staggering down the stairs, Rue prepared herself for the choice she had to make. She needed sleep. Dozens of people upstairs needed her help. Some of them might die in the hours she stole for her own needs. But if she didn’t take those hours, others could die because of a mistake made by her deprived brain. In the end, she decided to sleep first—for an hour at most—and work later. One way or another, she had to do both. Unfortunately, the decision wasn’t in her hands. OMGOMGOMGOMG!!!!!!!!!!!! That’s… *sputters* … *flails* Holy cannoli that’s one hellava cliffhanger. I couldn’t turn that page fast enough!! !